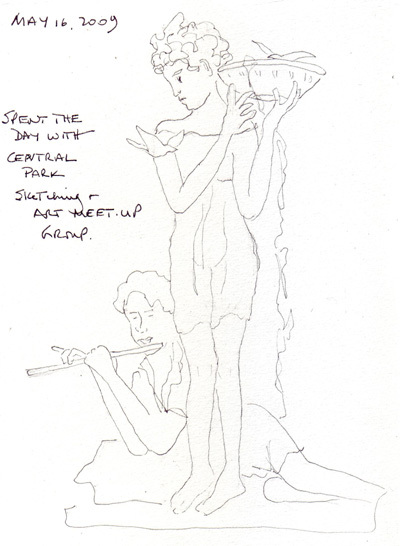 I had breakfast with my friend Istar and then we joined the Meet-Up Central Park Sketching and Art Group at the Central Park Conservatory Garden at 5th Ave and 105th St. This was the first time that either of us attended, and in spite of the earlier rain, the time there was delightful. This group selects an area, everyone sketches for 30 minutes, and then gets together to put all of their sketchbooks next to each other for everyone to see. 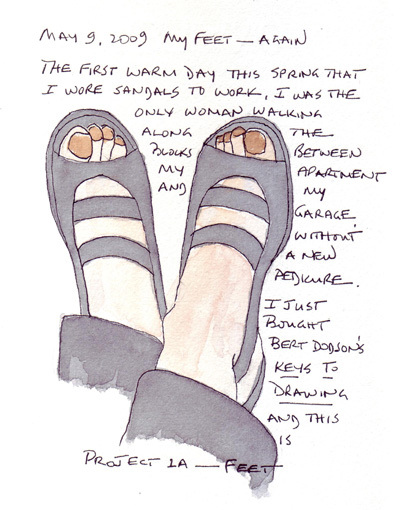 It is wonderful to see what others choose to sketch - and how many interpretations there are of the same spot. I sketched a fountain during the first period, and may still paint it. 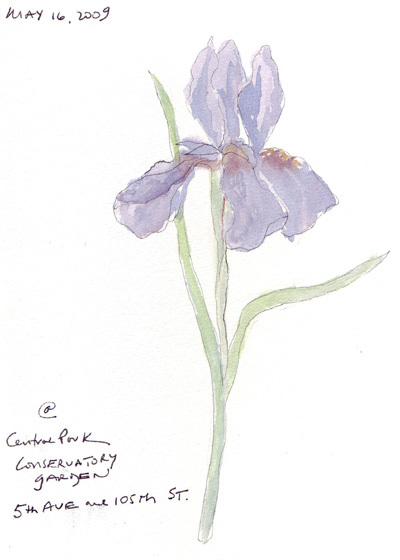 The flowers in the gardens were wonderful, and irises were a topic on several blogs this week, so I had to paint one. 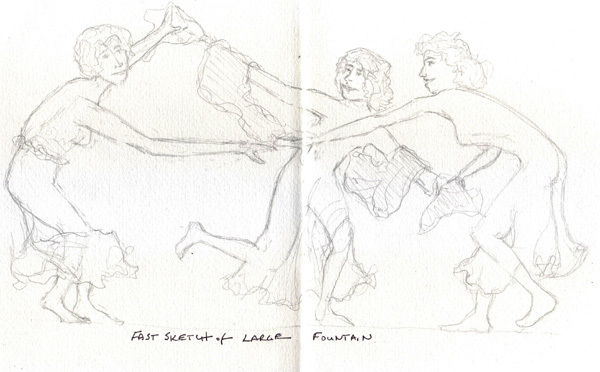 During the 3rd and final period I sketched a large fountain with three dancing girls - overly ambitious for the time period we had. I did finish a pencil sketch, but it didn't scan well and is on a double page spread with a wide shadow on the scan over the center fold. Although I could work on the scan in Photoshop, I'd rather return to the garden to draw them again over the next few weeks. This was a difficult challenge for me. I could think of lots of sounds I really like (my grandchildrens' belly laughs! ), but nothing I wanted to draw or could draw. I could also think of lots of sounds I don't like. After several days, I realized that one specific tape I made for my original old Sony Walkman got me through many long airplane trips and could still relax me instantly. We took our children to see the musical Cats the first year it opened on Broadway and I loved Rum Tum Tugger's performance by Terrence Mann. Several years later we saw Les Miserables where he originated the part of Javert on Broadway and sang the song "Stars". Then he made another performance in Scarlet Pimperal and was the first Broadway Beast in Beauty and the Beast. I love his voice and recorded his songs from these show albums for my Walkman. 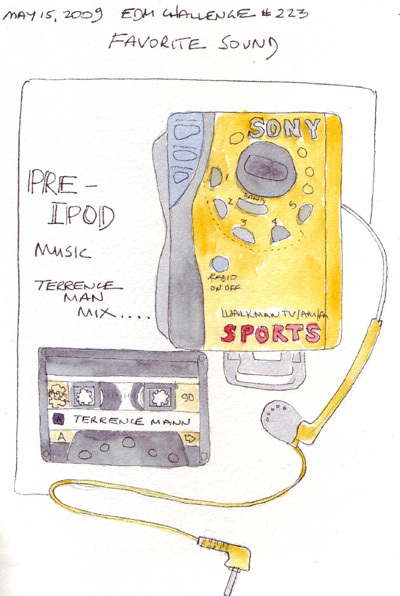 I stopped using my Walkman in the last few years, mainly due to the extreme limitation on size of carry on luggage (especially when we were traveling back and forth to London in 2006-07) and my need to carry my camera and charger, and art supplies, sketchbooks, etc in my carry-on bag. I'm not someone who wants an iPOD in my ears all day long so I never spent time trying to recreate this music selection. It may be time for me to learn about "itunes". The last few days were so busy that I am just finally uploading my journal pages from yesterday and today. 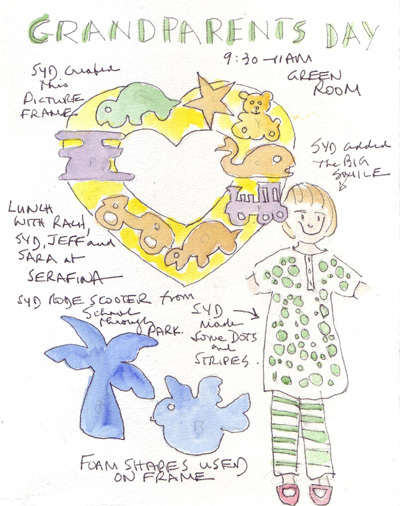 Yesterday was Grandparent's Day at my grand daughter's Pre-School and while she was making a foam picture frame, I was drawing her project and a cartoon figure of her. She insisted on a "big smile" and drew on her mouth herself. Tonight I took 5 minutes to draw a figure for more practice. I select a photo, set the timer for 5 minutes, and then sketch with a watercolor pencil. 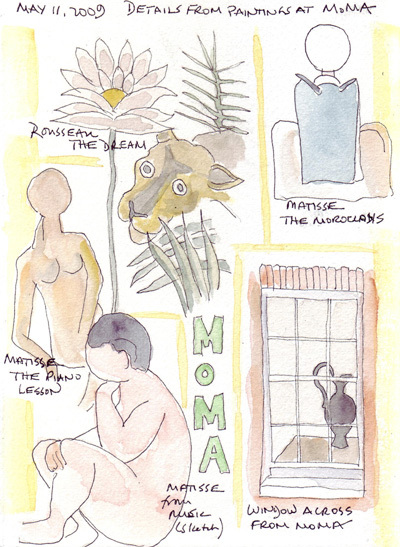 We visited MoMA today with old friends and I sketched details from a few paintings while walking through the permanent exhibit. It gives me an opportunity to learn a little from the drawings of masters, and allows me to create a journal page to remember the visit.